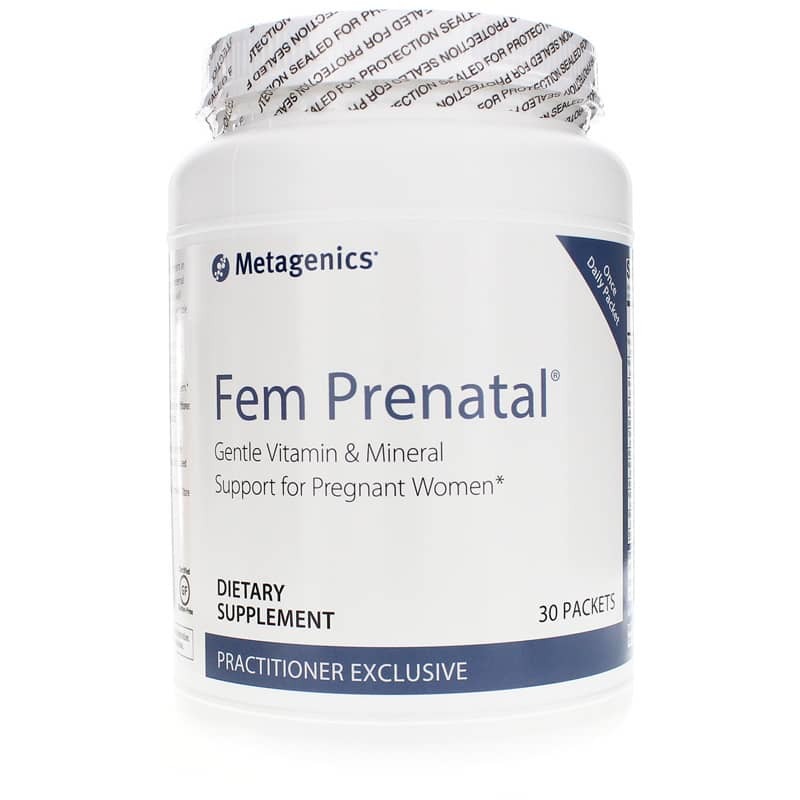 Fem Prenatal from Metagenics provides a comprehensive prenatal multivitamin and mineral supplement designed to help pregnant to help pregnant women meet their increased nutritional needs. Prenatal vitamins and minerals supplements supply additional doses of nutrition to prepare your body to give birth and to help your childs development. And most doctors recommend the added insurance of a multiple vitamin and mineral supplement. Taking one packet of Fem Prenatal a day not only provides more convenience but also means greater compliance. 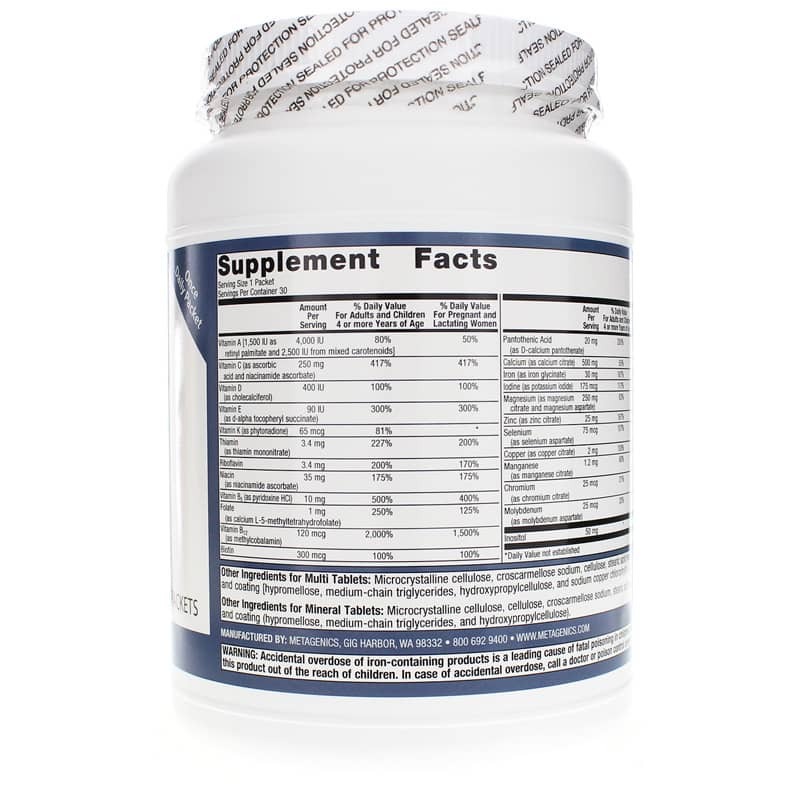 Significant level of Vitamin C - 417% of the recommended daily value for pregnant women - to support healthy tissue maintenance, iron absorption, and immune function, as well as promote healthy development of cells, collagen, bones, and teeth. 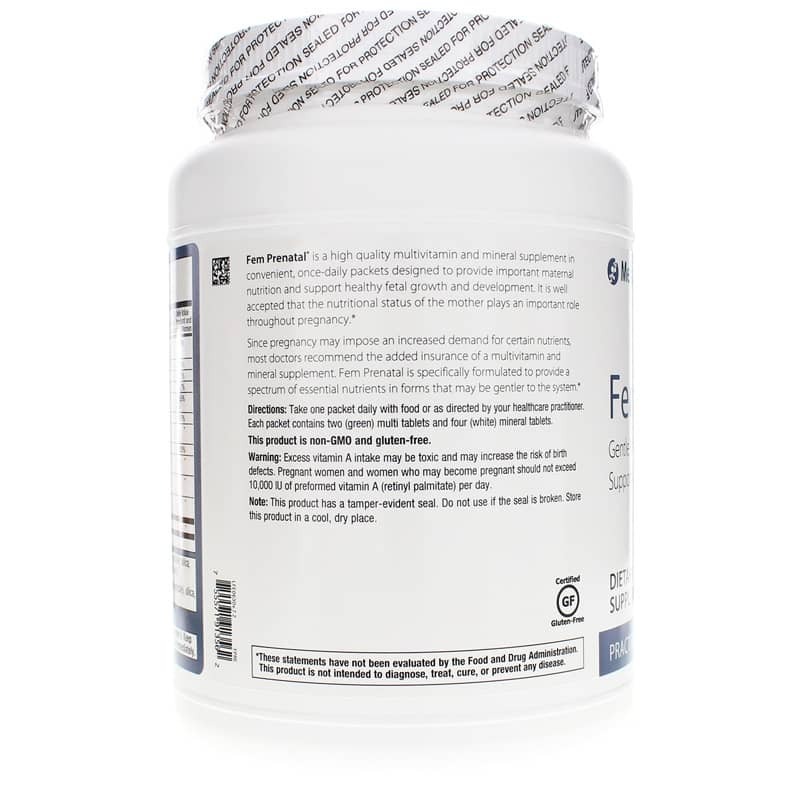 Fem Prenatal is also composed of high quality, bioavailable ingredients in a form that is gentle to sensitive stomachs. Other Ingredients for Multi Tablets: Microcrystalline cellulose, croscarmellose sodium, cellulose, stearic acid (vegetable), silica, coating (hypromellose, medium chain triglycerides, hydroxypropylcellulose, and sodium copper chlorophyllin). 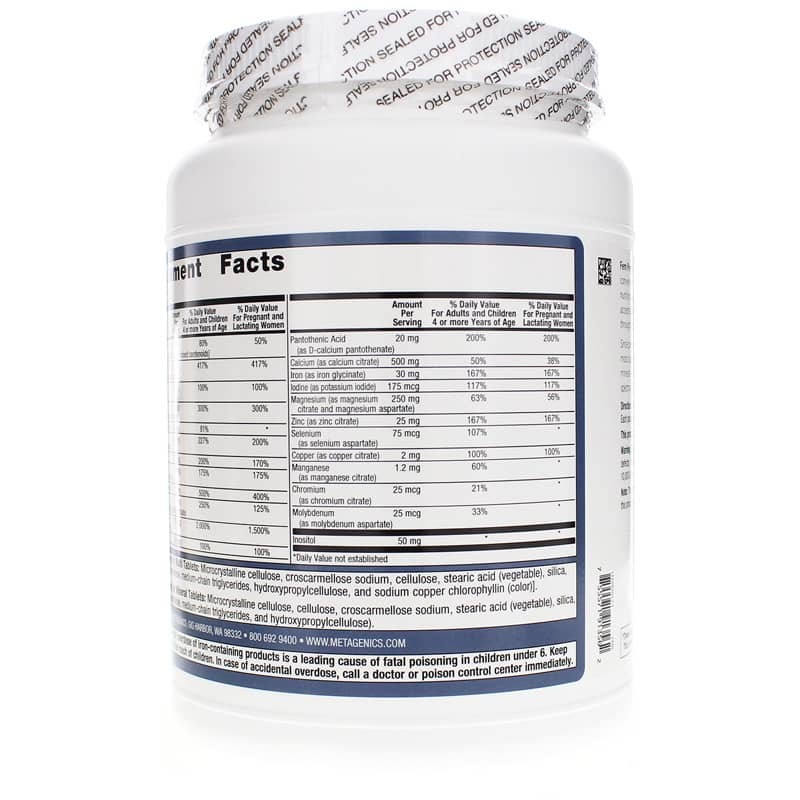 Other Ingredients for Mineral Tablets: Microcrystalline cellulose, cellulose, croscarmellose sodium, silica, stearic acid (vegetable), and coating (hypromellose, medium chain triglycerides, and hydroxypropylcellulose). Adults: Take one packet daily with food or as directed by your healthcare practitioner. Each packet contains two (green) multi tablets and four (white) mineral tablets. Excess vitamin A intake may be toxic and may increase the risk of birth defects. Pregnant women and women who may become pregnant should not exceed 5000 IU of preformed vitamin A (retinyl palmitate) per day. Accidental overdose of iron-containing products is a leading cause of fatal poisoning in children under 6. Keep this product out of reach of children. In case of accidental overdose, call a doctor or poison control center immediately. If you are pregnant or nursing, please consult your healthcare professional before using this product.